Work is now well under way on our exciting Wellcome Trust funded project ‘Development of Magnetic Resonance Imaging (MRI) at the University of Nottingham’, as covered in the previous blog post. Project Archivist Zoe Ellis updates us on one of the main strands of the project: the digitisation of around 18,000 35 mm slides. These include images of MRI scans of the human body, graphs of experimental results, pictures of MRI equipment, and photographs of the individuals involved. 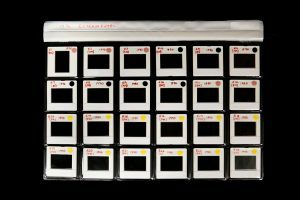 Viewing the original slides is very time-consuming and requires the use of a light box or slide projector, neither of which is ideal for processing such a large quantity of slides! We are therefore producing digital images of all the slides, which can be accessed easily by all project team members on any PC. This is particularly useful because MSC will be relying on expert academic help to identify many of the specialist images and determine their importance. We are delighted that this help will be provided primarily by Professor Peter Morris, who was himself one of Peter Mansfield’s PhD students, later becoming the Director of the Sir Peter Mansfield Imaging Centre from 1994 to 2016. Before digitising each slide, we record details such as any text written on its border, what type of container it is in, and its location within that container (the slide holders include hanging plastic pockets, individual slide boxes, and even a cigar box!). Each slide is also assigned a temporary number for processing purposes. Slides are commonly digitised using flatbed scanners in custom-made trays, however, to produce high resolution scans this way is a slow process. Therefore, a Nikon D810 full frame DSLR camera and Zeiss 100mm macro lens was chosen to produce high quality images at a much faster rate, and a bespoke camera rig was commissioned. 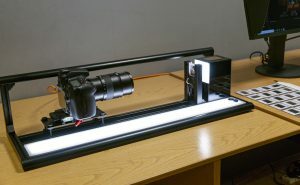 This system, created by Icam Archive Systems Ltd, operates on a track, at one end of which is the mounted DSLR camera and at the other, a holder to secure the slide in position. The camera can be moved along the track and secured in order to set the optimum focus distance and its height above the track can also be adjusted to fine tune the framing of the image. Positioned behind the slide holder is a daylight balanced cool LED light source which illuminates the transparency film and controls the accuracy of the colours in the images created. When a slide is inserted into the holder the camera exposure is automatically triggered, allowing the photographer to capture the image without touching or moving the camera. The camera is also tethered to a PC, allowing the photographer to review and process the images straight away. Whilst the light source and camera settings give a consistent capture, where detail has been lost in either the original camera exposure or in the ageing process of the film material, we can edit and restore details where possible. The images are then produced in a TIFF file format which serves as the master preservation file and in JPEG file format which intelligently reduces file size and serves as the access file for researchers. 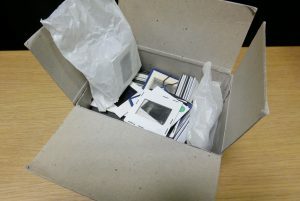 After digitisation, each image will be viewed and appraised, and a decision made on whether to retain it permanently for the archive collections. Finally, the retained slides will be repackaged into polypropylene slide storage sheets for long-term preservation, and they will be assigned permanent catalogue numbers. The catalogue descriptions of the slides will appear in our online catalogue, along with the descriptions of the research notes, publications, patents, lecture notes and personal papers also present in the collections. 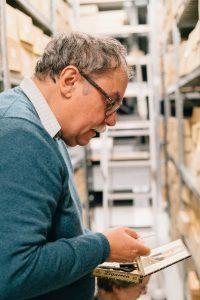 We will be reporting on the cataloguing, and the interesting material we are finding, in future blog posts and issues of our newsletter Discover.